Beads add sparkle, shine and visual interest to a variety of crocheted appliques, motifs and shapes. 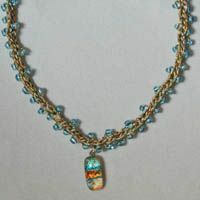 Beaded crochet jewelry will enhance any woman's wardrobe. If you'd like to crochet a project with beads, you'll find plenty of free patterns to choose from. You'll enjoy them all. Showcase your creativity with this stunning beaded crochet necklace. This beaded crochet cell phone holder is sized to fit the Apple Iphone 3GS and other similar gadgets. Beaded Crochet Cell Phone Holder -- Photo © Amy Solovay, Licensed to About.com, Inc.
Crochet this pretty beaded cell phone holder using seed beads and size 3 crochet thread. Pincushion With Beaded Crochet Edge. Pincushion With Beaded Crochet Edge. Photo and Free Crochet Pattern Are Both © Amy Solovay. This gorgeous pincushion features an easy beaded crochet edge. Are your ball-shaped Christmas ornaments looking a little bare? We've provided a pattern that will help get 'em looking sparkly and delightful for the holidays. This is a project that can be made ahead of time; you can work on these at any time of year, stashing them away for gifts or ornament swaps. You won't believe how easy this project is! Pretty seed beads accent this delicate-looking cuff style bracelet. Beaded Crochet Snowflake. Beaded Crochet Snowflake Motif - Photo © Amy Solovay, Licensed to About.com, Inc.
Beaded Crochet Heart Shape. Beaded Crochet Heart Shape -- Photo © 2010 Amy Solovay, Licensed to About.com, Inc. This pretty beaded heart shape makes a great applique. It could also be adapted in other ways. The heart shape is made using this beaded crochet technique, which is a versatile way to create a variety of different beaded crochet motifs and shapes. On the Left: Beaded Apple Motif. On the Right: Tunisian Crochet With Cross Stitch Framed by the Beaded Crochet Apple Motif. Beaded Crochet Apple Motif - Photo © Amy Solovay, Licensed to About.com, Inc.
Beads add visual interest to this delightful contemporary apple design. I've posted a free pattern for using this apple motif to embellish a crocheted purse, but feel free to use it on any appropriate craft project. For experienced or determined crocheters, beads and wire are a stunning combination to experiment with using together. These materials are well-suited for making interesting crocheted jewelry projects. This chic bracelet is one example of what can be done with beads, wire and a crochet hook. This bracelet is similar to the one linked above, but it uses different supplies and the stringing pattern is a little bit different. When you look at this wire crochet pendant, the beads aren't necessarily the first thing that catch your eye; yet they do add quite a bit of visual interest to this design. Combine metallic fiber and shimmery oval-shaped cathedral beads to make this bracelet. This pretty bracelet sparkles and shines! The effect is created by a combination of purple and gold faceted cathedral beads and raspberry-colored metallic fiber. Crochet this easy bracelet using smooth round beads and shimmery metallic embroidery floss. Sometimes a little touch of beadwork is the perfect way to make a project more interesting. One example is Erica Jackofsky's lovely trellis lace stole with beaded edges. It's gorgeous even without the beadwork, but the beads in the design are the icing on the cake.